3D Printing is as bad as... Using an electric frying pan. We're still working on 3D printing here, a grad student and I, and I'm still very pregnant, so today's story from Gizmodo oh-so-helpfully freaked the hell out of me and likely all 3D printing hypochondriacs around the world: "3D Printing Indoors Is as Bad For You as Smoking a Cigarette Inside". If anything will get me to read a scientific article about atmospheric pollution, that title will. I followed the links in the Gizmodo story to Phys.org's article, "3D Printers Shown to Emit Potentially Harmful Nanosized Particles." This is not my favorite site for scientific news, as it's often full of press releases disguised as reporting and poorly-reported scientific articles. So, after reading at Phys.org that "The emission rates were similar to those measured in previous studies of several other devices and indoor activities, including cooking on a gas or electric stove, burning scented candles, operating laser printers, or even burning a cigarette," I had to go read the scientific article. In the study, accepted for publication in the journal Atmospheric Environment, Stephens, Azimi, El Orch, and Ramos studied the concentrations of ultra-fine particles (UFPs) in a 45 cubic meter office with a combination of five 3D printers variously running and variously printing in ABS and PLA (the two major types of plastic filament on the market). They measured the UFPs in the room at baseline/period 1 (with printers off overnight), period 2 (two printers running for 20 minutes using PLA), period 3 (2 printers with PLA and three with ABS, each running for 20 minutes), and then once they turned the printers off (period 4). The authors admit that their study design is not perfect: after all, there's no real way to compare the differential effects of printing with PLA versus ABS. And they don't note which brand(s) of 3D printers were used. Anyway, the results are interesting. 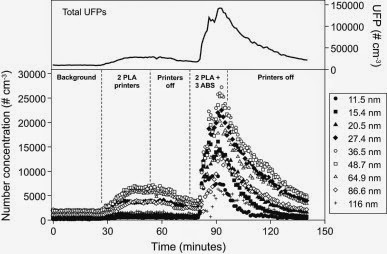 Figure 2 from the article shows a massive spike in the concentration of UFPs when the five printers were running. (However, they did start from a higher baseline than zero.) Considering they simply added three printers with ABS in this period, it would seem that ABS -- which has to be printed at higher temperatures and is known to be toxic, whereas PLA is biocompatible and made largely of corn -- is a major problem in 3D printing indoors. UFPs, the authors note, "deposit efficiently in both the pulmonary and alveolar regions of the lung, as well as in head airways" and are "associated with adverse health effects, including total and cardio-respiratory mortality." Several recent studies have also reported size-resolved and/or total UFP emission rates from a variety of other consumer devices, appliances, and activities such as laser printers, candles, cigarettes, irons, radiators, and cooking on gas and electric stoves. Unfortunately, it is not straightforward to compare our results directly to results from many of these studies because they have varied in both their minimum and maximum measured particle sizes, as well as in their definition of UFPs. However, Buonanno et al. (2009) reported total UFP emission rates over the same size range as ours measured during various cooking activities. For comparison, our estimate of the total UFP emission rate for a single PLA-based 3D printer (1.9-2.0×1010 #/min) was similar to that reported during cooking with an electric frying pan (1.1-2.7×1010 #/min). The same 3D printer utilizing a higher temperature ABS feedstock had an emission rate estimate (1.8-2.0×1011 #/min) similar to that reported during grilling food on gas or electric stoves at low power (1.2-2.9×1011 #/min), but approximately an order of magnitude lower than gas or electric stoves operating at high power (1.2-3.4×1012 #/min). Alrighty, then. Phys.org wildly misinterpreted fairly straightforward prose, and Gizmodo picked it up without checking the original source article. ...both [PLA and ABS] can be characterized as “high emitters” of total UFPs. These results suggests [sic] caution should be used when operating some commercially available 3D printers in unvented or inadequately filtered indoor environments. Additionally, more controlled experiments should be conducted to more fundamentally evaluate aerosol emissions from a wider arrange [sic] of desktop 3D printers and feedstocks. Unfortunately, this doesn't answer my question, which is... Am I harming myself or my unborn baby by running one or two MakerBots in my office? I could probably run a printer in the fume hood in the forensic anthropology lab to be extra safe, and I'll likely cut way back on my 3D printing until after the baby's born. But considering I wasn't printing a whole lot to begin with -- thanks, MakerBot, for making 3D printing rather difficult! -- and knowing how little time I've run each of the printers in the last year, it doesn't seem to be a high risk to my health or to the baby's. Something to think about, though, if you are into or want to get into 3D printing. B. Stephens, P. Azimi, Z. El Orch, T. Ramos (2013). Ultrafine Particle Emissions from Desktop 3D Printers Atmospheric Environment DOI: 10.1016/j.atmosenv.2013.06.050. Yeah, I'd thought about the possibility of environmental pollution, but had mostly ignored it until I remembered, Duh, fetus! Glad your MakerBot is also finicky... well, not glad per se... but nice to commiserate! Hi Kristina! I realize this is an old post, but I am glad I found it. Our office recently got our finicky MakerBot to work. Although I am not running the MakerBot, my office is adjacent to it, and I am six months pregnant. There is very little info out there that I could find related to 3d printing safety and pregnancy. Did you uncover any more info after this blog post? Hi, Katie. I never did go look for more info. I wasn't in my office much last summer, and I was on leave for the fall. FWIW, I had my daughter in early October, and she's totally healthy. :-) Good luck with your pregnancy and with your search for more info!